Educators who are already connected via social media and open education resources (OER) know how empowering it can be to have a network of peers, experts, and high quality resources available to them and their students. Some teachers want to experience the same benefit, but either aren't sure where to get started, or have been overwhelmed by social media before and are hesitant to go back. But getting started on social media can be intimidating. Too often I have heard fellow educators say, "I joined Twitter, but I didn't really get it right away so I haven't used it." Sometimes, educators dive right into social media for professional networking. But soon they are overwhelmed by the people and resources and aren't sure how to curate it all in a way that is helpful for their teaching and their students' learning. 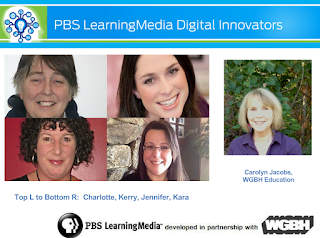 The Massachusetts PBS LearningMedia Digital Innovators came together last week for a webinar with our best practices on Twitter, blogging, and curating. How to get started with Twitter. Finding a "tribe" through Twitter chats. Curating resources using tools like Diigo, Flipboard, and Feedly. We also shared our favorite PBS LearningMedia resources. To watch the video of the webinar and follow along with the busy live streamed chat window filled with participants questions and tips, click here or the image below. October is Connected Educator Month and it was a appropriate that WGBH teamed up with four connected educators from all around Massachusetts to kick off the month with the webinar on October 7. It was a pleasure to work with Carolyn Jacobs at WGBH, along with fellow educators Jenn Judkins, Kara Wilkins, and Charlotte Corbett to plan the event.